Who are Meghan and Andrew? This past weekend was a big success on many accounts. First and foremost, we went on our longest run to date! While Andrew’s arches were bugging him, he still got in a decent run before having to end early :0(. I got in a definitely personal record- 6.02 miles! I ran it in my sneakers mostly to see if it was easier to wear sneakers now that I’ve been wearing the five fingers. What I found out was that no, sneakers are more uncomfortable- something that I now have a blister to show for. Needless to say, I’ll be going back to running in my five fingers ASAP. 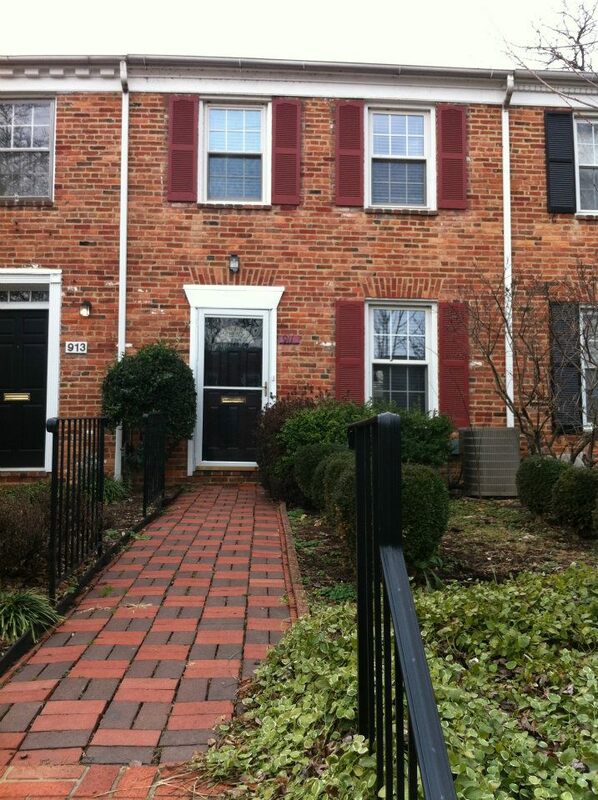 The other great news is that we signed a lease for our first HOUSE! At right is a picture of the front. It’s located in Old Town and has 2 bedrooms, 2 baths, a walk out finished basement with washer/dryer, hardwood floors, and a backyard/patio. It’s a little more expensive than our current apartment, but we think it’s definitely worth it! So, we spent part of this weekend at the house taking measurements and pictures and part of the weekend cleaning and packing up our apartment and trying to get it ready to show to potential subletters. We had a few bites and are waiting to hear back! We will be moving in just two weeks, which is crazy and exciting all at the same time. More to come! Last week’s new dish for the week was an adapted recipe from emilybites.com. The recipe was Bubble Up Enchiladas. They’re pretty awesome. Just imagine biscuits, veggies, ground beef, ooey gooey cheese… you can’t go wrong, really. 1. Preheat oven to 350 F. Add olive oil to a large skillet over medium heat. When pan heats up, add in garlic and onion. Cook until onion becomes translucent and garlic is very fragrant. 2. Add ground beef and cook until browned and no pink. 3. Add the bell peppers, black beans, and enchilada sauce. Mix thoroughly. 4. Cover and allow to cook over medium for about 6 or 7 minutes. 5. Cut the biscuits into smaller chunks (we did about 6 per biscuit) and drop into skillet. Mix. 6. Take a 9×13 baking pan and lightly spray with pam or olive oil. Pour the skillet mixture in and spread evenly. Bake for about 30 minutes. 7. Remove pan from oven and sprinkle cheddar cheese over top. Place back into the oven for about 5-10 minutes or until cheese starts to bubble. About a week or so ago, Andrew and I decided to start a money for miles project. The general idea is you agree on a certain amount of dollars to put into an account for each mile ran/jogged/biked/walked/etc. This money that we save up will go into a savings account and someday we’ll plan on doing something nice with it! Ah yes, work outs #7-#11. As we blogged in our last work out update, we headed to Dallas for the weekend so we weren’t sure how our training would fit in. Well, now that we’re back, I’ll tell you: it fit perfectly. Friday morning, Andrew let me go to the gym while he stayed home and straightened up (best boyfriend ever). Our long ride for this week was 15 miles and I was determined to get it done before Dallas. It was so hard for some reason! The past few work outs have been tough to get started but eased up as I fell into a pattern– this work out was not like that. It was rough and I was sore and pushing myself throughout the entire ride- perhaps because I went to the gym later than normal? Who knows, regardless, I finished my 15 miler on rolling hills at greater than 12mph so I was happy. Both Saturday and Sunday mornings, we got up early to work out in the gym before family festivities. On Saturday morning we got in 2 miles and on Sunday morning, Andrew completed another 2 miles and I ran 3.1! My first 5K in about 8 months. It felt fantastic. I couldn’t have been happier. Monday we were back in town so we biked to the grocery store, picked up some essentials, and biked back– it was only a little over 4 miles total but I’ll tell you what, we need to start training outdoors and on real bikes- SUCH a difference. Tuesday, Andrew ran about a mile and half and I ran about two miles. 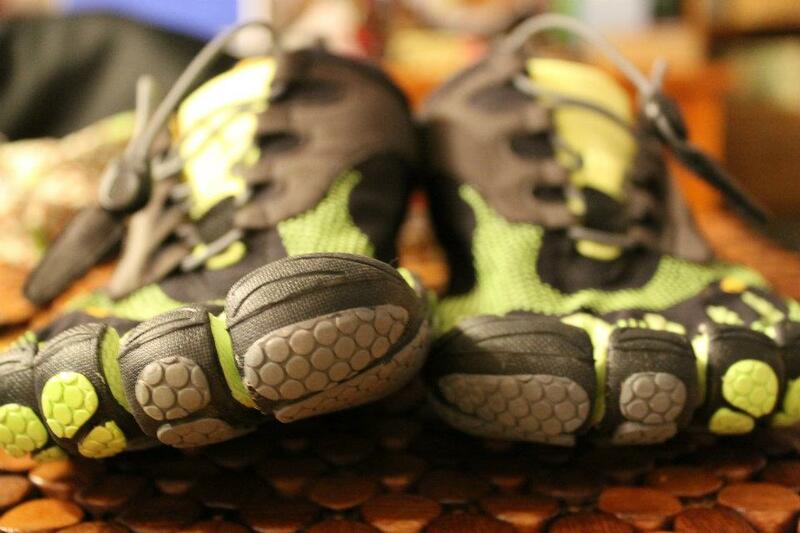 And we did it in our new vibram five fingers! It felt great! And there you go! Work outs #7 – #11! 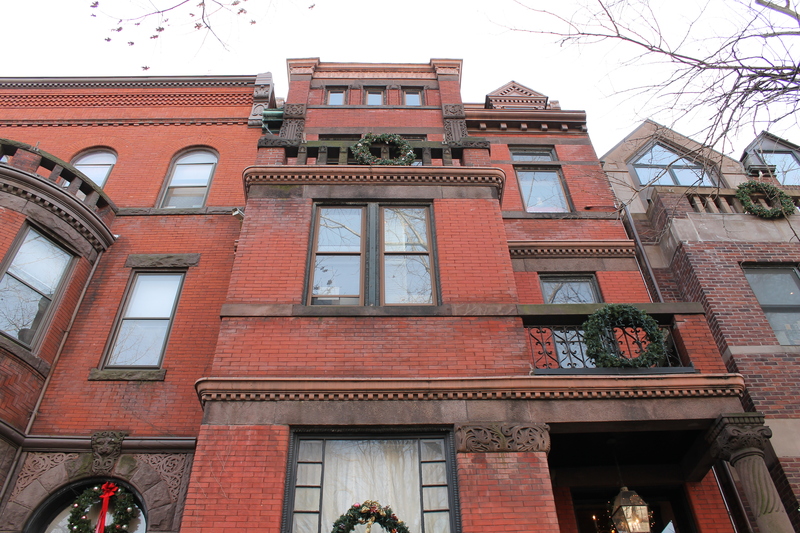 One of the places to visit on our 2012 Bucket List was the Mansion on O Street. 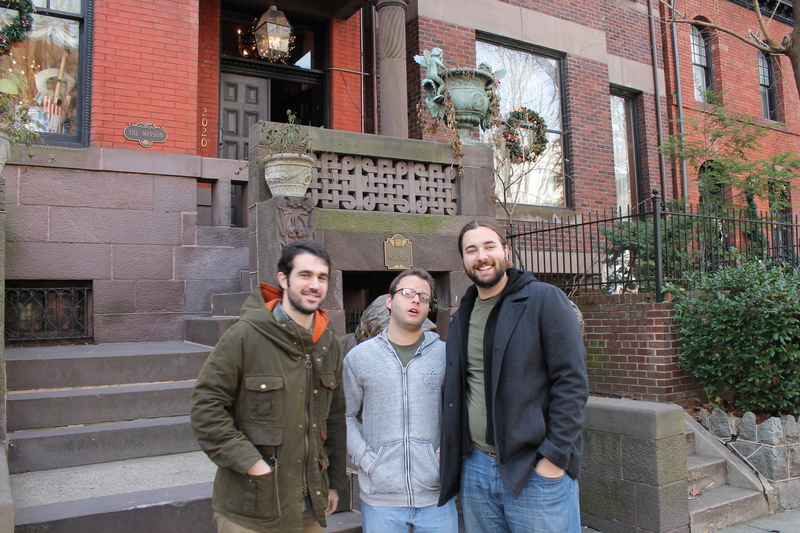 Luckily, when Andrew’s friends came into town, along with getting try out the Wafle Shop and Pork Barrel BBQ, we were also able to knock off Great Falls National Park AND the Mansion on O Street! 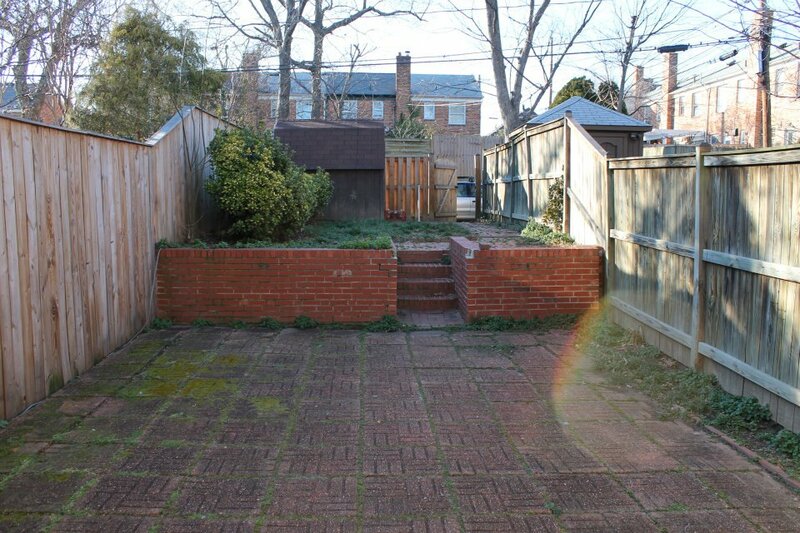 This post is dedicated to the Mansion on O Street. 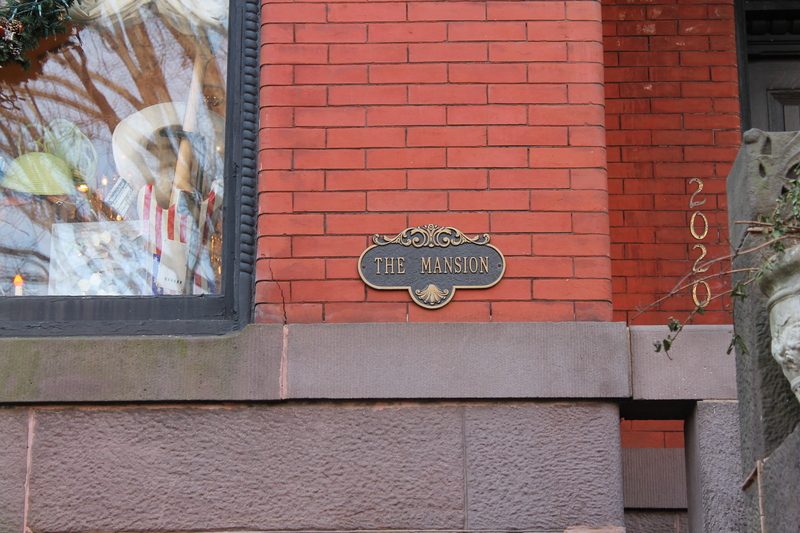 For $5 and a phone call, you can land yourself a self-guided tour reservation at the Mansion on O Street. It’s not always open to the public but on Sundays you can always get in to check out the scene. First off, we didn’t get up as early as we had hoped so we didn’t get to have breakfast before we went, instead we arrived and rang the door bell (like you do at mansions) and we were ushered into the foyer where we were immediately surrounded by the smells of hundreds of foods (seriously). Apparently on Sundays they also have a big brunch. We asked how much it cost- $65 a person. No thank you. It looked good but I don’t know if it looked that good. We waited for our whole party to arrive and then the woman of the house came and chatted with us. 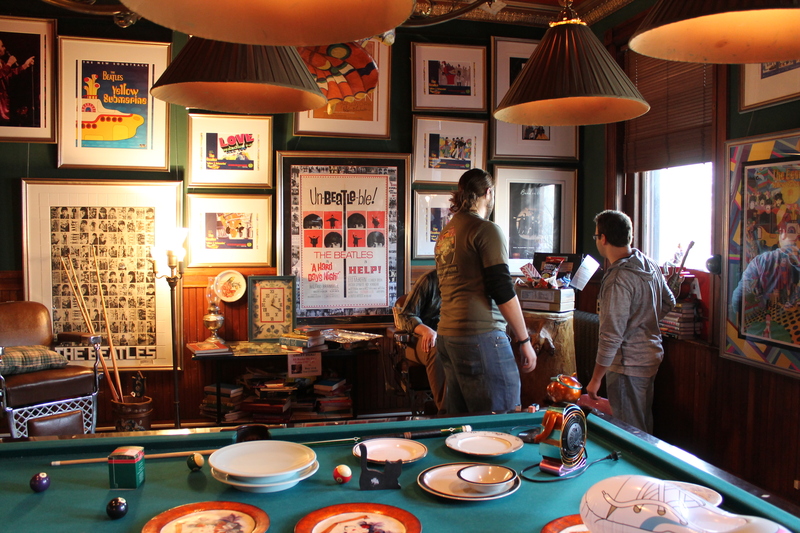 The mansion is about 4 townhouses put together, four floors, and full of “stuff.” That’s the best way to describe it. Everything but the guitars is for sale in the mansion- everything. 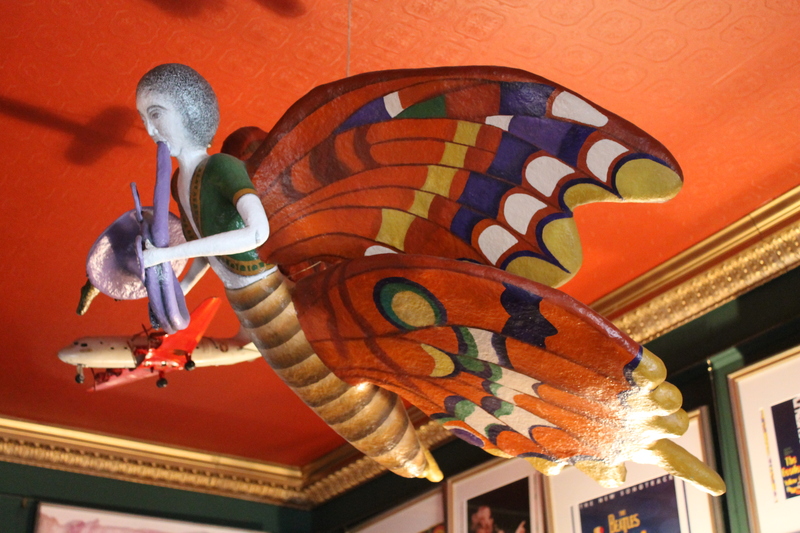 Furniture, dolls, clothes, carpets, paintings, glassware, posters, lights/lamps, pool tabes, juke boxes, beds, etc. 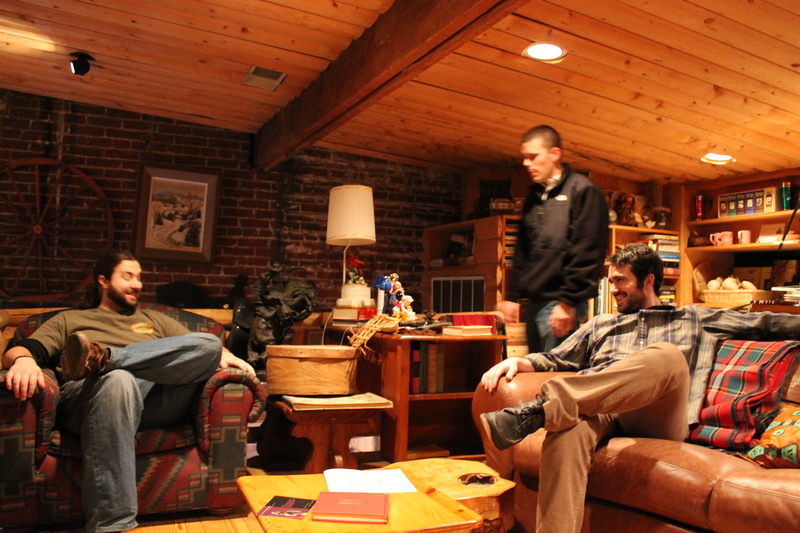 We began our self-guided tour in the “log cabin.” This was probably my (Meghan’s) favorite room in the mansion. 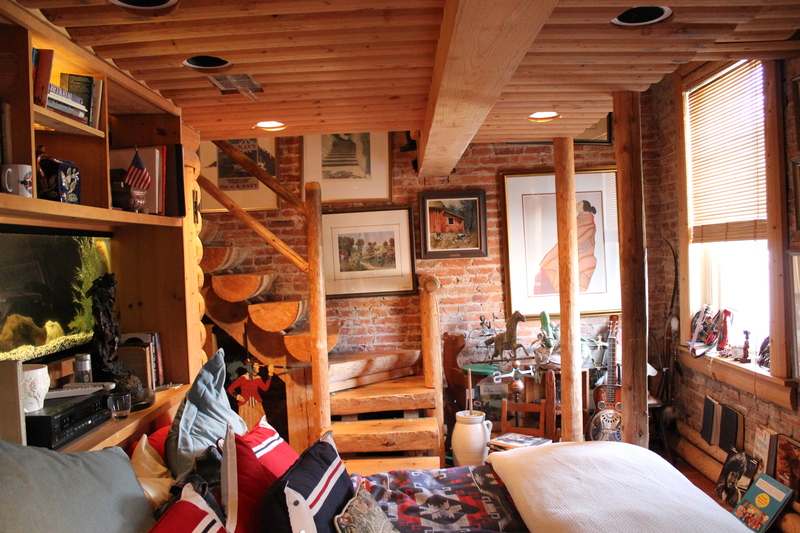 Log cabin walls, a fire place, comfy couches, two stories, a big bed with wool blankets, etc. 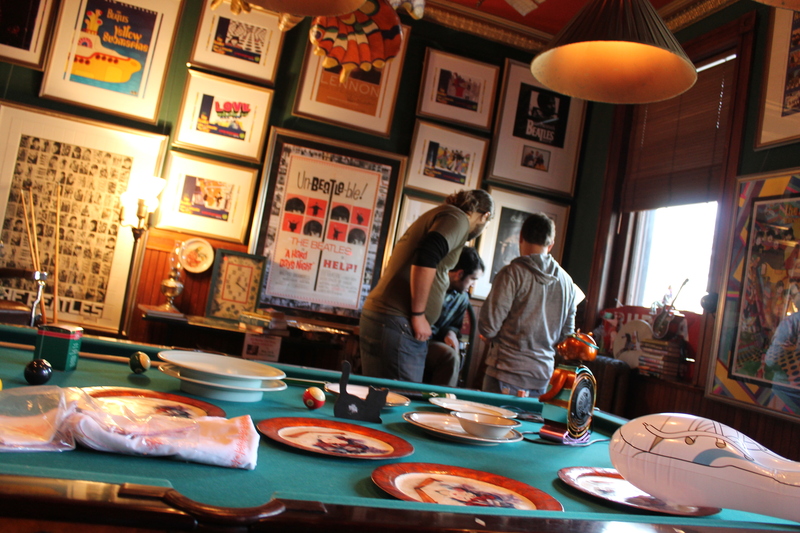 The rest of the mansion had a variety of different themed rooms. You were to abide by the signage (there are folks who actually stay here as a hotel so if a sign says do not enter it’s because someone is staying there). There are also hidden doors and rooms– of the 34 we found maybe 4? Needless to say we’ll have to go back. 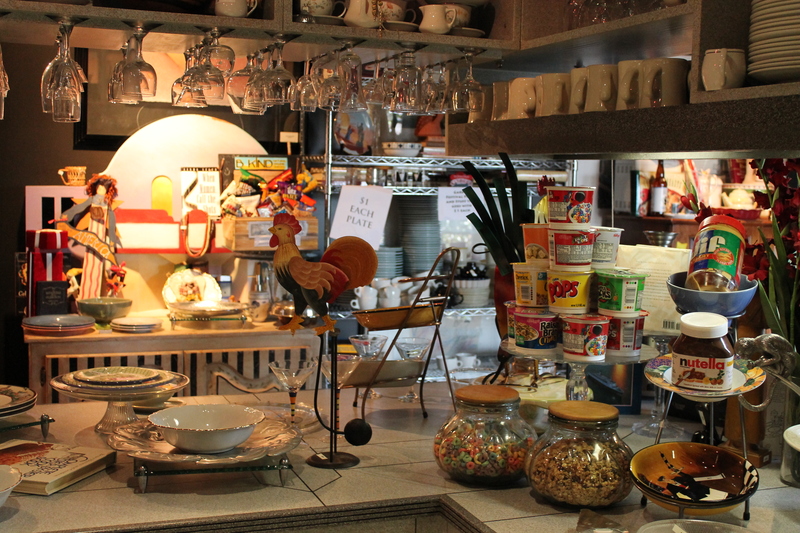 It is definitely worth the trip just to experience it– but it really is like a giant flea market mansion. The bathrooms are super impressive with giant jacuzzi tubs and see through walls and what not. All in all a fun excursion and not bad for $5. Continuing on with our new dish a week, we headed off to pork-land. We found a barbacoa pork recipe and adjusted it slight to come up with our new dish of the week! 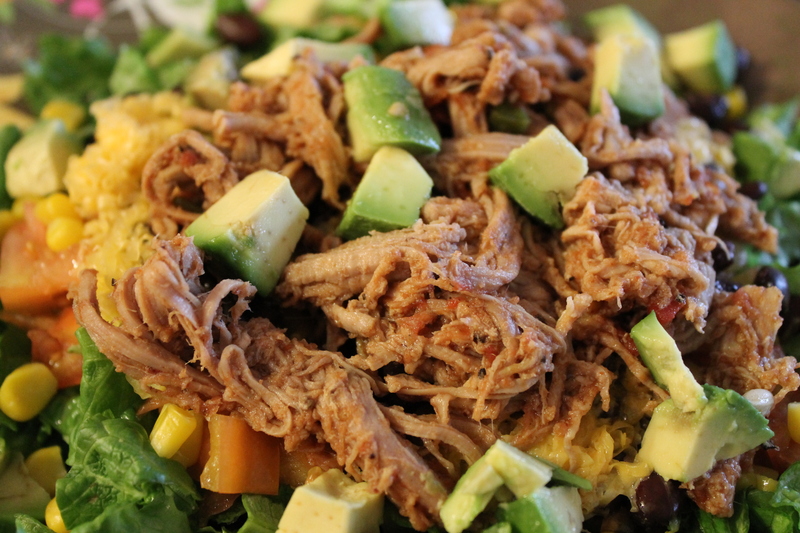 We made this recipe in the crock pot over the weekend and then used the pork throughout the week for lunches– perfect! 2. Add 6oz. coke zero and 1/4c brown sugar. Stir and let sit and marinade between a few hours and overnight (we waited overnight). 3. Add the 1/4 cup water and turn crock pot on high for 3-4 hours (we waited 4). Remove the pork from the crock pot and discard any excess liquid. Shred the pork and set aside. 4. Combine the 8oz coke zero, the peppers and chilies, the tomatoes, the brown sugar, and the seasonings in the crock pot. Stir a few times. 5. Add the shredded pork to the sauce and stir to mix. Cook on high for another 1-2 hours (we waited 2). Adjust salt, pepper, and other seasonings, to taste. This pork was delicious and we used it to make sandwiches as well as salads. 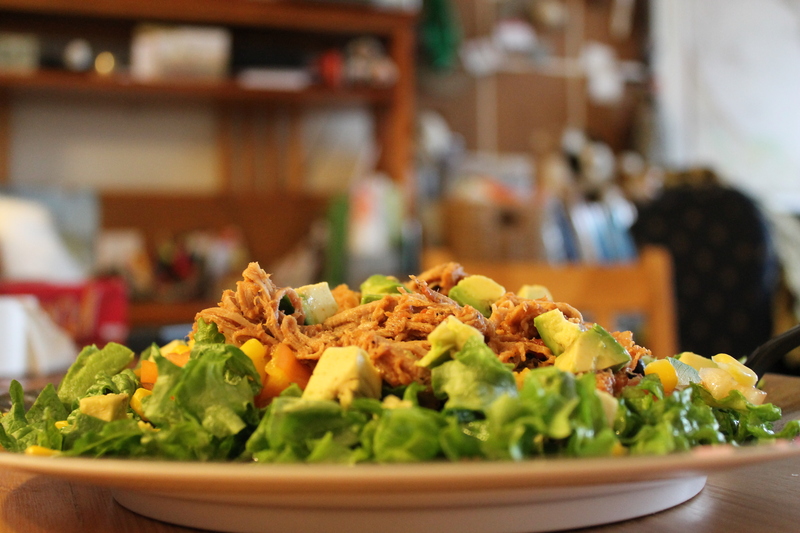 Below is a picture of the salad– it’s romaine, corn, black beans, tomatoes, onions, pork, and avocado. YUM! Oh there’s so much to blog on, where to begin! I suppose we’ll start with working out. We’ve been to the gym a few times and we spent a great afternoon hiking in Great Falls National Park in Virginia! Our workouts are really going well. We seem to be improving and keeping up pretty high spirits. We’ve been switching off between jogging and biking. Some days biking more and some days jogging more. We spent one evening jogging outdoors which as you might imagine was harder than jogging indoors but still not horrendous. So far in January, combined, we have jogged 11.2 miles and we have biked 81.4 miles. Tomorrow we’re heading to Dallas, TX but not until the afternoon. This means we’re off to the gym in the morning to try and get a 15mile bike ride in. We’re still following with the schedule which means we don’t have to get another long ride in this weekend, but maybe we will– we get back from Dallas on Sunday so perhaps we’ll do something Monday morning. Meghan is tossing around the idea of signing up for a half marathon that’s two days before her 28th birthday as an actual running half marathon but we’ll have to see how things go. Check out that bad boy to the right. Looks pretty tasty, right? That’s the Desayuno Tipico- served up fresh at the Waffle Shop in Arlandria, VA. 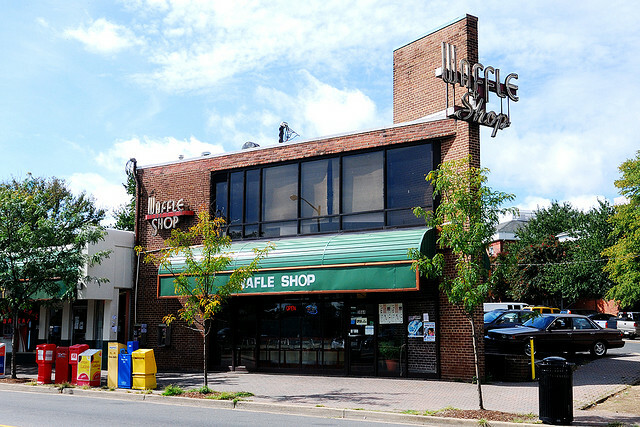 The great thing about this somewhat-sketchy restaurant in a somewhat-sketchy neighborhood on the Northern end of Del Ray, is that the restaurant spells “waffle” in two different ways on the same side of the building. Fantastic. When you walk into this restaurant, you’ll see a bar with backless stools that have pain chipping off them. There’s a small grill, two waffle irons, some cans of soda, and a couple loaves of white bread on the shelf behind the counter. There are two or three employees hanging out, wiping down the grill and checking on the one or two other folks in the joint. The bar probably sits a max of 20 people. We sat down and one of the employees walked over with a big smile, welcoming us, and hanging us each a menu. The menu ranges from greek food to mexican dishes to philly cheese steaks to waffles and ice cream or waffles and chicken. They’ve got scrapple, bacon, sausage, hot dogs, grits, eggs, toast, etc. We spent $38 for the four of us. We got: 3 coffees, 1 diet coke, 8 eggs, 3 waffles, scrapple, ice cream, bacon, a hot dog, onion/peppers/tomato, black beans, rice, and plantains. Not to shabby. 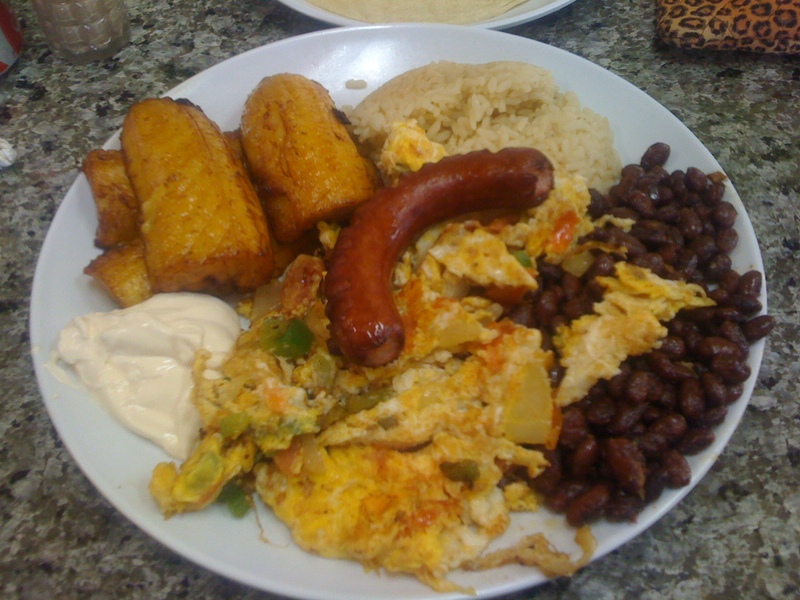 The desayuno tipico consists of the following: eggs, hot dog, veggies, black beans, rice, and plantains. DELICIOUS! Yesterday, we went to Pork Barrel BBQ for dinner with two of Andrew’s friends, Josh and Dani. Pork Barrel BBQ was one of the restaurants on our 2012 Restaurant Bucket List! It was delicious. In the image at right you will see all the food that we purchased for the four of us. The total came to $53 and it included: 1lb. pulled pork, 1lb. brisket, 1/2 rack of ribs, two sides of mac n’ cheese, one side of collard greens, and one side of Texas caviar (white bread was free). For those of you who don’t know, Texas caviar is a black eyed pea salsa-esque dish– it has onions and peppers and spices in it. 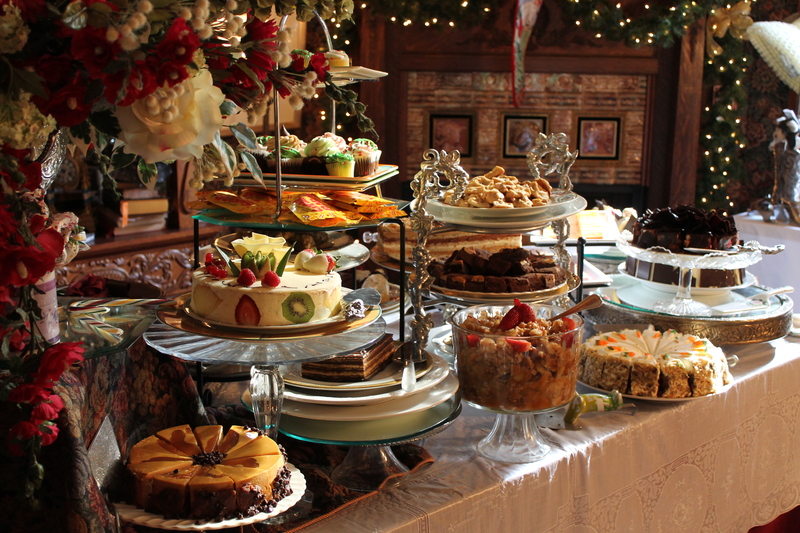 Absolutely scrumptious! You order the meal at the register, sort of cafeteria style. You wait for your number to be called and pick up your tray of dishes. Along with that, you can order sodas or non-alcoholic drinks. Any beers, wines, or cocktails get ordered at the bar. The strangest part of the meal? There are no plates. You simply get a piece of butcher paper to put down on the table and you fork your food onto to it to eat off of… Each table also has there 3 house made sauces- a mustard bbq, an original bbq, and a sweet bbq. Meghan thought the sweet bbq was the tastiest. 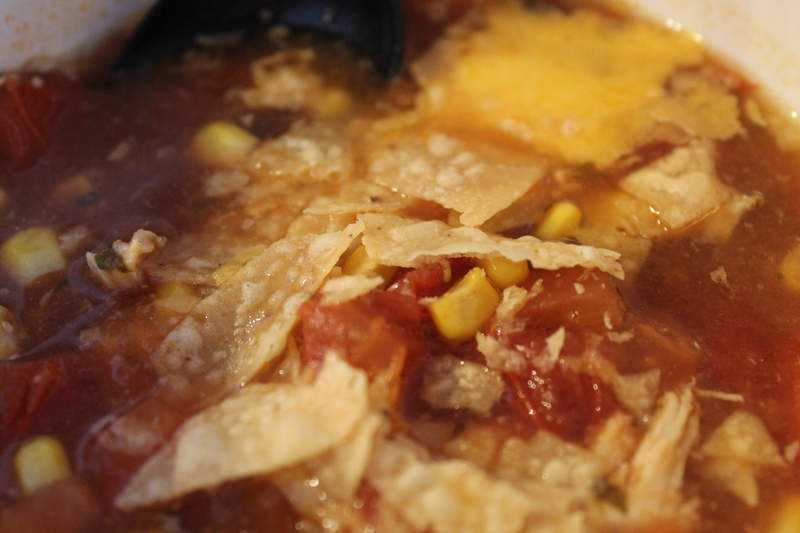 Our first featured new dish of the week is Chicken Enchilada Soup. It is delicious! Since we’re usually really busy we want to try to cook a dish on a weekend that we can then use throughout the week for lunch and/or dinner. Meghan found the original recipe for this soup on skinnytaste.com and after adapting a few ingredients here and there, we found the perfect combo. You can eat the soup plain or you can top it with cheese, scallions, sour cream, avocado, tortilla chips, etc. It has just the right amount of zest and it fills you up! 2. Slowly add the chicken broth to the garlic-onion mixture, stirring all the while. Add in the tomato sauce, again stirring to combine. Add the adobo sauce and minced chiles. Bring contents to a boil. 3. Add the cilantro and remove skillet from the heat. Pour skillet contents into crock pot. 4. Add the beans, corn, and spices (we used about 1 teaspoon of each) to the crock pot. Mix well by stirring. 5. Drop the chicken breasts (uncooked and whole) into the crock pot. Set crock pot to low, cover it, and let cook for 4-5 hours (we let ours go about 4.5 hours). 6. Remove the chicken and using two forks, shred. Return to crock pot and stir. Adjust seasonings to taste (we added a bit more pepper). Soup’s on! 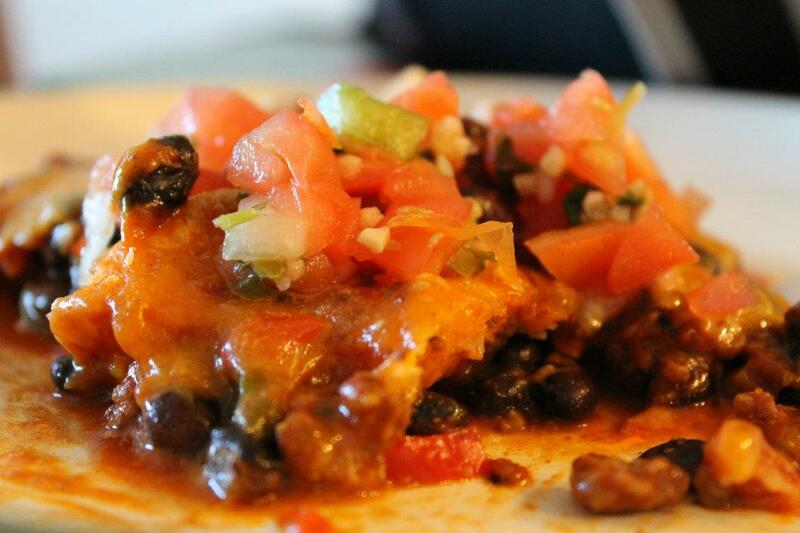 To serve, top with diced scallions, sour cream, avocado, shredded cheese, tortilla chips, or just about anything else! Enter your email to take the adventure to your inbox!